This year's theme is "Moments of Connection" and will be highlighted throughout the planner, the limited edition Starbucks Philippines 2013 planner will be available in three leather covers, which is white, black and green, and it comes with a magnetic bookmark. What's more is that it has thirteen (13) "kindness cards" with different treats to be redeemed with friends and family. 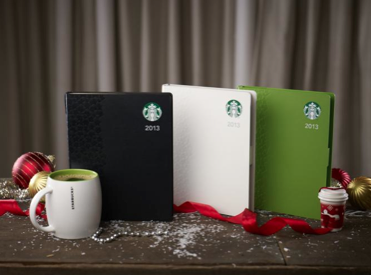 Customers can avail of the Starbucks 2013 planner from Nov. 3 - Jan. 8, 2013. You know the drill, collect a sticker for each Starbucks beverage purchase, a total of seventeen (17) stickers comprising of nine (9) Christmas beverage treats plus eight (8) core beverages except bottled drinks. And as for the past years, every redeemed Starbucks 2013 planner comes a donation for the children of SparkHope - a partnership with UNICEF. So let's enjoy our favorite cup of coffee drink, and rekindle the joy with the Limited Edition Starbucks Philippines 2013 planner. Awesome! I gotta get me one of these badboys :) Starbucks here I come!